OH MY WORD! PB and chocolate are GREAT. These cupcakes are phenomenal!! The pudding and the sour cream make the cake moist and springy. The PB buttercream icing is to die for! And that little surprise in the middle is over the top! Combine all of those ingredients with a mixer. This batter will be quite thick-much thicker than typical cake batter. The oil and pudding will make it very easy to scoop into tins. Scoop into 24 cupcake paper lined muffin tins. 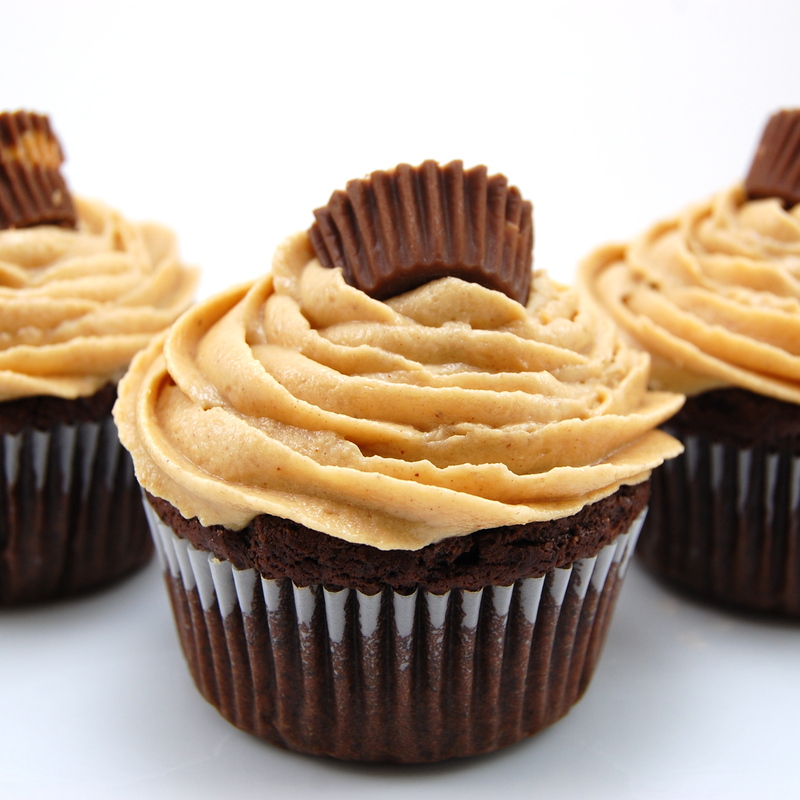 Unwrap 24 mini Reese’s, push one in to each cupcake batter portion. The cupcake mixtures doesn't have to cover the peanut butter cup, when they bake it will make a nice well in the cupcake that you can fill with icing! Bake for 18 minutes. No need to test them, they may seem a little wobbly, but they will be perfect. MEANWHILE, mix your frosting.... Combine the butter and peanut butter in bowl and mix with mixer until cream. I usually pour about a cup a time and carefully mix it. During the mixing of the sugar, you can add your milk Don't refrigerate the icing, because it will be too hard to get on the cupcakes. I have a pampered chef decorator that I use a star tip to ice the cupcakes, but you can simply put it in a ziploc bag. Get all the air out, and then snip just the tip off bag. That will make a perfect decorator. I then take 12 more of the peanut butter cups and cut them in half and put one half of the cup into the icing and press down.